Join the discussion on our forums! Come discuss Gentle Megasaur over in our dedicated Gentle Megasaur discussion topic. Finally we can see some cool The Curator synergy. its broken. first of all as his name hes a gentle fucker he shouldnt have 5 attack 2nd why would you give him 5 attack his battlecry alone fucks opponent up why in the world wou*ld you give him insane stats too for on*ly 4 mana. Murlocs are so annoying by themselves, when you less expect , they swarm the board again and they have insane synergy between them. this gentle megasaur just made them even more powerfull OP, when they get windfury, it's GG. it's so ridiculous, this thing should at least have worse stats to compensate the insane effect it gives to murlocs. This minion's text could be "adapt a murloc", and it would still be very good. Look at the stats of this card and compare it to Enhance-o Mechano Isn't it just a power creep? Not really. 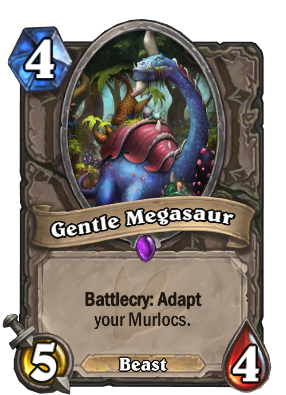 Megasaur only affects murlocs, also your adapt choices aren't always going to be good. Looked like pack filler when it was revealed, now it seems like every other ladder game ends with this card. Damn i knew i should've crafted Finja when i had the chance. I smell a The Curator deck brewing! If he's so gentle then why is he so mega-sore? Why does almost noone recognize how cool this card is lore wise!?! Yes of course, in one of the diaries, the murloc related one from whoch this card was revealed, we find out that a whole murloc village has home on its back, and that megafin makes it walk around, and we also learn that it makes its murlocs adapt by making some kinda roar.